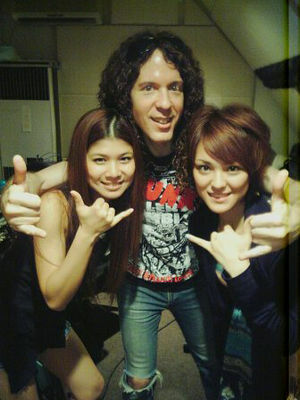 Marty Friedman (born Martin Adam Friedman, on December 8, 1962) is a Jewish-Japanese-American guitarist best known as the lead guitarist for the thrash metal band Megadeth from 1990 to 1999. He now resides in 日本国, where he hosts a number of TV shows, including ヘビメタさん, ロックフジヤマ, and ジュークボックス英会話. Marty gets all the chicks. 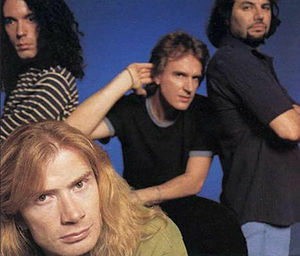 Megadeth's 1999 lineup: Marty Friedman, Dave Mustaine, David Ellefson, and Jimmy DeGrasso. David has gone deaf from listening to too much metal. After the 1989 release of So Far, So Good... So What!, Megadeth band leader Dave Mustaine once again fired half his lineup and set about rebuilding the band. As per tradition, he replaced drummer Chuck Behler with his own drum tech, Nick Menza; The search for a new lead guitarist was not as easy, with many auditions held over the course of over seven months. Friedman was eventually selected for being way better than his predecessor, Jeff Young. In 1990, Megadeth released its first album with the new lineup. Rust In Peace was hailed as "awesome" and "heavy" and "really difficult to play" by fans and citics alike, and to this day is acclaimed as a definitive thrash metal album. The album went on to sell over 500 million copies in the US, and was nominated twice for the Best Metal Performance Grammy; it lost both times to Metallica, which made Dave cry. Countdown to Extinction, Megadeth's 1992 album, was a stylistic departure from the band's previous releases. While still driven by fast technical riffs, the songs were shorter and more radio-friendly. The change was motivated by Metallica's Black Album, Dave's megalomania, and Marty's awesome taste in music. The move paid off and the album was Megadeth's most successful release. The trend continuted with Youthanasia, the band's 1994 album. While Friedman was in Megadeth, the band sold a total of over 100 million albums worldwide. American music will never be as good as Japanese music. American fans are too whiny and American labels never give artists the leeway to make good music.